Sound has the ability to harm or to heal, to both create and to destroy. In this article we will look in particular at the power of percussive sound and its relationship with martial and healing arts. Science tells us that our universe began with the coming together of mysterious forces, to cause a reaction so immense that it gave birth to space, time and matter – everything. We call this the ‘big bang’. The sound of the original ‘bang’ is still being detected in outer space, suggesting that the tone goes on sustaining us and all creation. From this comes the idea of the music of the spheres – that the vibrations of the planets in their orbits create harmonious music. We know that everything in the universe is vibrating, is in motion, and has a rhythm. Every atom and molecule can be said to be dancing its own unique dance of creation and all these dances combine into one great dance that is in a process of continual evolution. In the Bible at the onset of St John’s Gospel in the New Testament it says: “In the beginning was the Word.” Here again, the ‘Word’ implies the creative process being related to sound. In India, this creative event is called the Nada Brahma and is the seed sound that gave rise to the universe - ‘Nada’ means ‘sound’ and ‘Brahma’ means ‘creation’. This seed vibration contains within it all possible archetypes, potentials and possibilities just as a seed contains the potential for everything from the root to the fruit. This process is represented by the mantric sound of ‘OM’ or ‘AUM’ – ‘the sound of sounds’ that contains the building blocks of creation and gives matter its numberless forms. The ‘OM’ root gives rise to words in our language that mean ‘all embracing’, such as omnipotent & omnipresent. 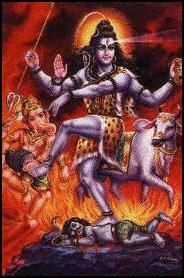 Shiva is often depicted as a dancer - ‘The Divine Dancer’ and has an hourglass shaped drum in one of his right hands. Both the hourglass shape and the beating of the drum represent the marking of the pulse of time and the rhythm of existence - the heartbeat. His dance is the movement of the stars, planets and solar systems in space – the cells, atoms and molecules within our bodies. It is Shiva who dances the cosmos into being and the myths tell us that when the drum stops beating and Shiva ceases to dance then the world will be no more. From one of his left hands emanate flames – these are the flames of destruction. On the one hand creation, on the other destruction. 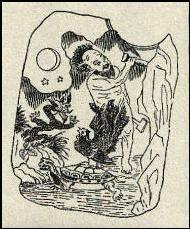 In Chinese Mythology, P’an Ku the legendary ‘architect of the cosmos’ pounded and chiselled upon the cliffs of Chaos to sculpt the earth, planets and stars. For eighteen thousand years he chiselled until eventually, satisfied with his endeavours, his body became the substance of the universe. In the pounding and chiselling we see again the idea of percussion and rhythm. In his name there may even be some connection with our language, for in Greek, ‘pan’ means ‘all’ or ‘everything’ as in the phrase ‘panoramic view’ and the word ‘pantheon’. The rhythm of the drum reflects the endeavours of P’an Ku and its boom echoes the roar of the big bang. There has always been close links between the martial arts and the healing arts, and just as we have considered the drum’s importance in the former, so too, it is closely connected with the latter. Drums have been used by all cultures since the earliest of times, to release tension, to accompany ritual and as part of celebration. From our time in the womb, the first sound we hear is the beat of our mother’s heart. Our bodily systems and functions all have their own rhythms that blend together and hopefully produce a harmonious whole. The whole of our natural world is made of rhythms and cycles that we interact with. In fact, even the phrases ‘sound health’ and ‘sound mind’ acknowledge the relationship of sound with well-being and perhaps suggest that we should discriminate about the sounds / noises that we absorb. In some traditional cultures the Shaman acts as an intermediary between the tribe and the spirits, between this world and the other world. Shaman are sometimes referred to, as ‘the wounded healer’ and their training can be rigorous, often to the point of near death to help establish a strong channel. They utilise chanting to summon the spirits, rattles to awaken the ‘sky eye’ and drumming so that they can ‘ride the rhythm’ to the World Tree. Their dance leads to trance and an altered state of consciousness from which they return with knowledge to help the tribe or its individual members. In modern society there are many alternative therapies that make use of sound in healing. Percussion is an integral part of much massage and ultra sound is used to shatter kidney stones and to assist in the healing of wounds. - different things at different times. This practice encourages the ability to keep one’s own centre whilst being centred in the group experience. Early humans will have been in awe of these sudden percussive sounds of nature and will have learnt to imitate them through striking various natural objects such as sticks and stones. This ability to manipulate ‘noise’ will have given rise to a fascination with the control of sound and in its innate power. In times of conflict the ability of sound to both frighten and inspire will have been recognised and utilised. 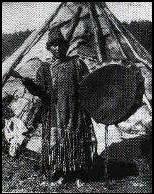 War dances usually involve drumming, stamping and whooping and there are Native American stories that recount how some conflicts were settled by this show of strength without the need for fighting. European armies found that the beating of swords against shields, accompanied with shouting, had the ability to energise ones own troops whilst causing terror to the enemy. The drum became an integral part of warfare with kettledrums mounted on horseback and snare drums strapped by the waist of foot shoulders. In the confusion of battle, it was possible to communicate messages to advance or to retreat by the use of drumbeat patterns. Modern warfare with all its noise of rifles, cannons, helicopters, airplanes and bombs, creates its own sounds and negates the influence of the drum. However, just as the sword is still used by the military in a symbolic role rather than in actual combat, the role of the drum has become a ceremonial one. 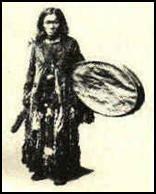 In the individual, as opposed to the collective, fighting arts, the use of sound and percussion has also been prevalent. This is apparent right from the most primeval of situations such as the beating of the chest by gorillas – an action copied not just by Tarzan but also by those wishing to imbue themselves with courage. Music that is predominantly percussive, accompanies some modern day martial arts. The Indonesian art of Pentjak Silat is often accompanied by music. The traditional music of Indonesia is the gamelan orchestra, which is a percussion ensemble featuring tuned gongs, bronze xylophones, drums and cymbals. Pentjak Silat will often be performed with a small group of musicians playing such instruments and movement sequences may be coordinated with the music. The Brazilian art of Capoeira has its roots with the African slaves who were taken to the ‘new world’. They were able to practice their fighting art by turning it into a dance accompanied by music and chanting. The main instruments used are: the berimbau, the atabaque (a conga type drum) and the pandeiro (a tambourine type hand held drum). The berimbau is a wooden bow, spanned by a steel string that is beat by a hand held stick. A hollowed-out gourd is attached to the bow and acts to amplify the sound. A small shaker of pebbles or beans is also held in the striking hand to enrich the sound, which can also be altered by pressing a stone to the wire. The game takes place in a circle and the berimbau dictates the rhythm and creates the mood of the interaction between the two players within the circle. Of course the drum is used in numerous performing arts, but here we will focus on its role in performing arts with a strong martial connection. Chinese Opera and in particular Peking Opera has many facets. In addition to singing, most operas include elements such as acrobatics, martial arts, mime and music. · Percussion: wooden clapper, drum, gong and cymbals. · Stringed: fiddle, lute and moon mandolin. · Wind: flute and clarinet. Of primary importance is the wooden clapper, for while musicians of a Western orchestra ‘watch time’ as directed by the conductor with the baton, Chinese musicians ‘listen to time’ as indicated by the sound of the clapper. Fight scenes are predominantly accompanied by the percussive instruments, featuring much crashing of cymbals and clanging of gongs. When Buddhism spread from China to Japan, it took with it temple drums known as ‘Taiko’. The word Taiko can be translated as ‘big drum’ - ‘Tai’ meaning ‘big’ or ‘great’ as in Tai Chi, and ‘ko’ meaning ‘drum’. Due to the deep rumbling sound and their power, Taiko drums became associated with the gods themselves and originally, only priests were allowed to play them. It has been said that the sound of the Taiko represents the voice of the Buddha. Within Buddhist ceremonies they serve to keep time, rhythm and structure during chanting. Later, these drums found their way onto the battlefield where they became efficient communication tools because their immense sound could carry over great distances. They have also been used in folk festivals and in planting and harvesting ceremonies to give honour and thanks to the gods of fertility. One Japanese saying proclaims that a village is only as large as the distance its Taiko sound will travel. Since World War Two, the Taiko has taken on a new role in performance art. A jazz drummer called Daihachi Oguchi who came across an old piece of Taiko music inspired this development. He integrated this traditional art with his jazz influences and formed an ensemble to play and experiment with this music. Groups such as Kodo and many others have taken the genre in new directions and helped it to spread beyond Japan. 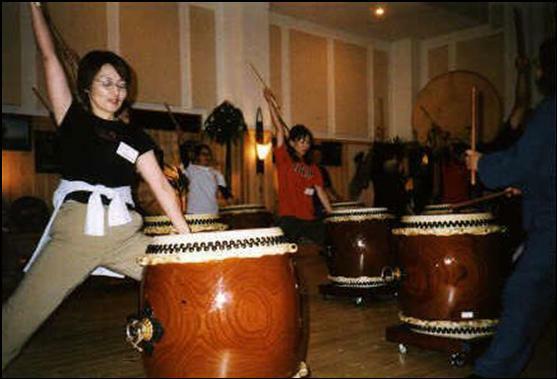 In Taiko much use is made of martial stances and martial inspired movement. Even in martial arts training, it is not possible to strike stick to skin without causing damage – the playing of Taiko makes this both possible and pleasurable. P'an-ku - the architect of the universe. Note three of the four celestial animals (tortoise, dragon and phoenix) are present, the fourth he is in the process of creating. So spoke the great twentieth century explorer of myths, Joseph Campbell. All sound comes from silence. All movement arises from stillness. The ten thousand things arise from and return to the void.